If preparing a whole turkey just seems a bit too daunting, then a roast turkey breast is a simple and delicious alternative. Especially when you give it a sweet orange-honey glaze! I’ll let you in on a little secret: I stopped preparing a whole turkey for holiday meals a long time ago. In our family, we tend to enjoy turkey breast more than the dark meat anyway. So quite a number of years back, I began preparing roast turkey breast instead, and never looked back! A roast turkey breast is much easier to prepare than roasting a whole bird. The meat is tender, juicy and succulent when prepared with a little TLC. This roast turkey recipe is loaded with flavor and lots of love, and sure to please whether it’s a holiday or you’re just simply craving a turkey dinner! When it comes to roast turkey breast, the more flavor you can give it, the better. 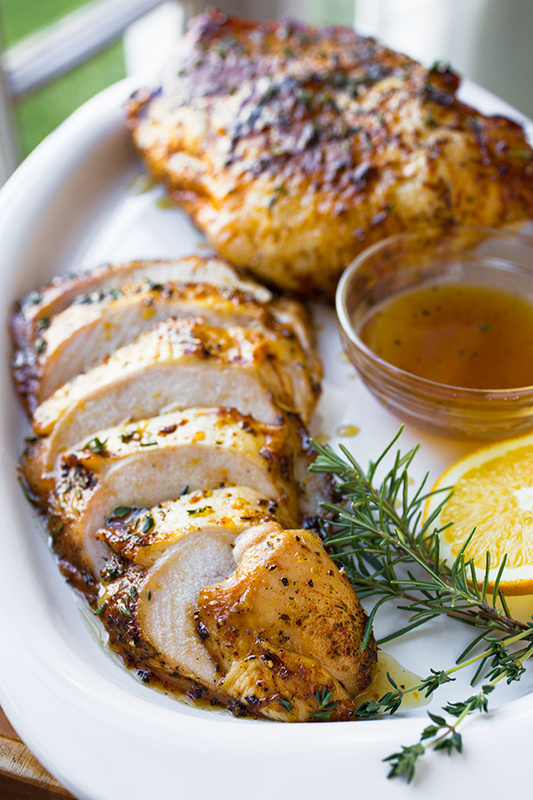 Seasoning with thyme, rosemary, and Herbs de Provence always makes the turkey more flavorful. 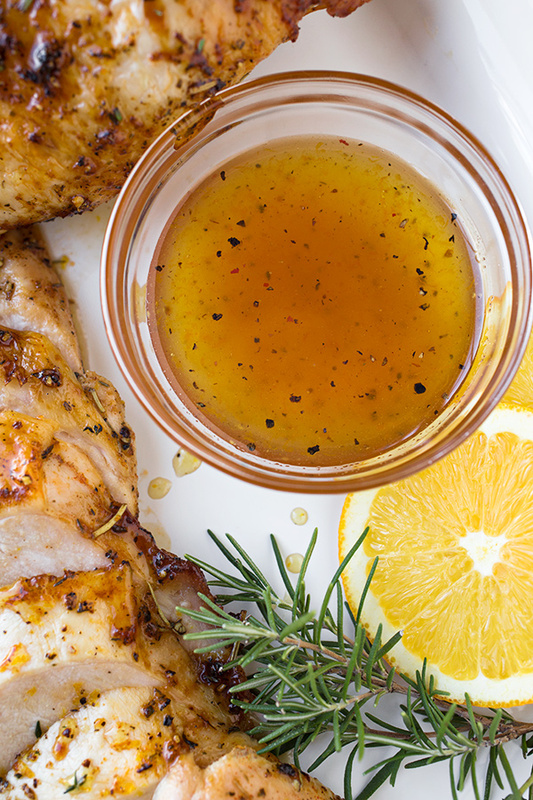 Since I wanted to kick things up a notch with this recipe and give it a hint of sweetness, I whipped up a simple little orange-honey glaze to go over top while it roasts. The glaze also gives the turkey a deeply golden-brown and crisp skin, and the slightly citrusy flavor pairs so well with the mild flavor of the turkey. It makes it so scrumptious and beautiful! 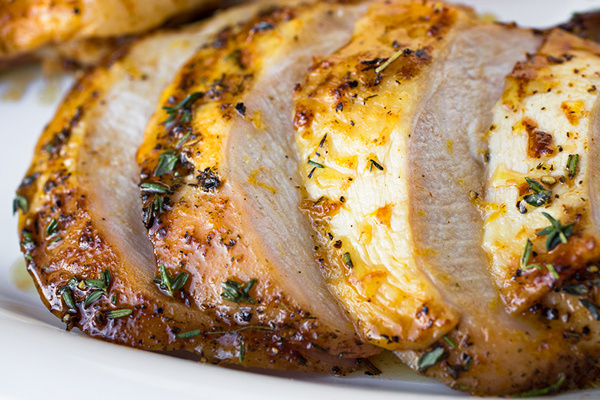 Here’s the wonderful news about a roast turkey breast recipe: it’s super easy! And isn’t that always a bonus? Typically, it takes right around an hour to roast a turkey breast. And because they are smaller and easier to work with than a whole bird, you can roast the breast(s) right on a wire rack placed over a baking sheet. To ensure proper cook time, I always recommend using a digital thermometer inserted into the thickest part of the meat. You’re looking for the thermometer to register 165°, and that way you know the meat is perfectly (and safely) cooked. I begin by preparing my simple orange-honey glaze, so that I have that ready. While I preheat my oven to 375°, I season the turkey breasts, and place them on a wire rack. I also insert my digital thermometer into the meat at this point. The turkey breasts are roasted for 30 minutes, and then I brush on some of the glaze. I continue to roast, brushing more of the glaze on periodically, until they reach 165 degrees and are cooked through and golden-brown. When done, I allow meat to rest for about 10 to 15 minutes before slicing and serving. Let’s talk turkey: Typically, turkey breasts are sold with skin on and the bone in. This is perfect, as the bone creates more flavor during the roasting. So opt for bone-in. Usually there is one breast per package, generally feeding about four people. This recipe calls for two turkey breasts, and feeds about eight people. Dried herbs during the roasting, fresh for after: Dried herbs, such as Herbs de Provence, are delicious to sprinkle on before roasting, as they will not burn; however, reserve the fresh thyme and rosemary for after the roasting as an aromatic garnish just before serving. Use a meat thermometer: I always recommend using a digital thermometer when roasting any kind of meat. That way there is no guessing. You should insert the probe into the thickest part of the meat, and once it registers 165°, you’re good to go. Prepare ahead for easy roast turkey breasts: You can prepare your glaze and season your turkey breasts even a couple of days in advance of when you plan of roasting and serving. Just wrap each breast very well and keep refrigerated. When you are ready to roast, allow the turkey and glaze to come to room temp for about an hour or two. Give it a rest: Once the turkey breasts are roasted, allow for at least 10 minutes of resting time before slicing and serving. This way, more of the juices will remain in the meat, keeping the breasts juicier and more succulent. 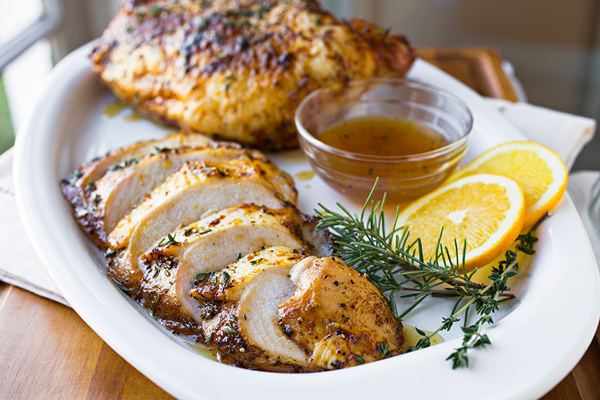 Roast turkey breast sprinkled with aromatic herbs and brushed with a sweet orange-honey glaze makes for a delicious meal anytime! -Begin by preparing the orange-honey glaze: add all of the ingredients to a small sauce pan, and whisk to combine; bring to the boil and reduce the heat to low to gently simmer the glaze for 10 minutes. -To prepare the roast turkey breasts: preheat the oven to 375°, and line a baking sheet with foil. 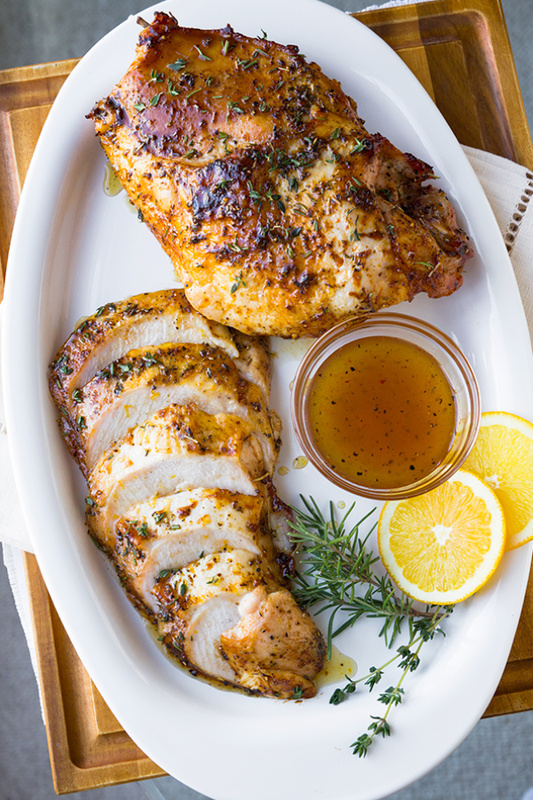 -Place the turkey breasts bone-side down onto the baking sheets, and drizzle with a couple of tablespoons of the oil; sprinkle a couple of good pinches of salt and black pepper over each of the turkey breasts, along with the herbs de Provence and the paprika divided equally among each. -Insert a digital thermometer into the thickest part of one of the breasts. -Place the turkey breasts into the oven to roast, and after 30 minutes, brush them liberally with one of the bowls of the glaze (reserving the other portion for use after the turkey is cooked). -Continue to roast for another 10 minutes, and then brush on more of the glaze. -Continue to roast for another 10 minutes, and brush once more with the glaze; roast for about another 10 minutes, and remove the breasts from the oven once the internal temperature reaches 165°. -Allow the turkey breasts to rest for about 10 minutes before slicing the meat; then once sliced, drizzle just a little of the reserved glaze over the slices, and sprinkle over the fresh rosemary and thyme before serving. Craving more turkey recipes? 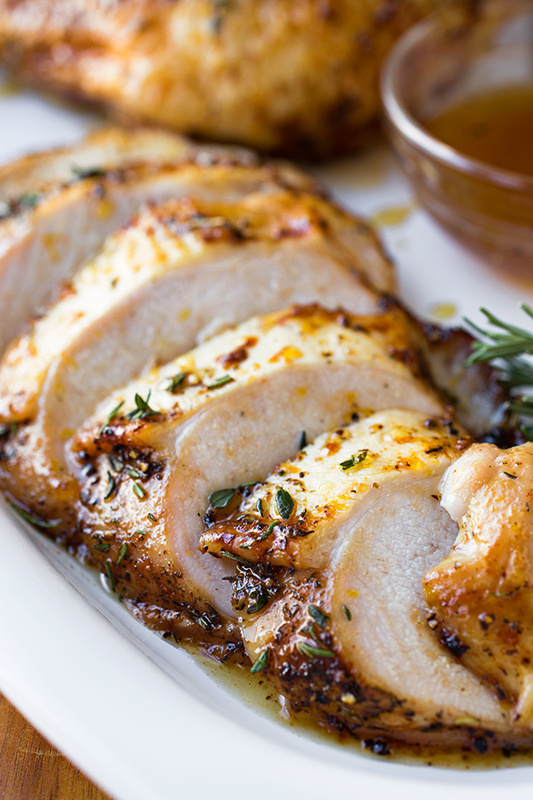 Check out this Roasted Garlic Turkey Breast, or this Roasted Turkey Breast Roulade! At some point or another, we’ve all most likely found ourselves in the rather uncomfortable state of limbo, or in a place of feeling insecure because of a lack of information. Perhaps you’re in the midst of experiencing that this very moment in your own life. It can happen in regards to our health, our finances, and our relationships, and we find ourselves trying to navigate what feels like uncharted waters, in the dark, and on our own; or groping around what feels like a room with the lights switched off, one which we’ve never previously been in. When we find ourselves in that mysterious and unique space between the known and the unknown, it can feel quite lonely and isolating; it can cause us to retreat into our heads and into our imaginations, where we often feed ourselves less-than-positive images of what’s to come in order to fill in the blanks for ourselves. And that only causes us to sink into worry or despair. But feeling alone and in the dark isn’t where our Creator longs for us to feel that we are, not when He stands right there next to us, eager to partner in whatever part of the journey we may find ourselves in. It seems that we spend so much of our time living in either a past that is already long-gone, or living in a possible future formed purely out of a vivid imagination. So where does that leave the present moment, which is happening right before our eyes, and is filled with so much potential for light and for good? There’s something very sweet and delicious, something glaze-like, about a present moment, a moment that is happening right now. It’s illuminated and full of what actually is, and full of the possibility for uplift because it offers us some reality to fix our eyes upon rather than the unknown. The present is also where our Creator longs to meet us, so that He can walk hand in hand with us in whatever mystery we’re walking in, shedding some light, if we really want it, on our path as we go. So no matter what limbo or state-of-unknowing we may find ourselves in, we really don’t have to feel alone in it; because the truth is, we’re not. The best remedy is to open our eyes wide and take in the light that is there before us: the people who we love and who love us; the displays of kindness and care and mercy; and the opportunity to use our own situation to uplift others as they go through theirs. Because in those things is where you find God. And the sweet thing is, we’re never really alone when we live in the present, and make the request for light to be shed upon it. Cook’s Note: This post was originally published in 2014, and has been updated with even more love! I’m usually not one for turkey, but this sounds great! Such a beautiful truths that we all need to be reminded of from time to time. The present is indeed a precious gift and a place I’m constantly reminding myself to stay planted in. Your turkey dish is lovely. Wenderly, thank you for your comments. Hi, we were thinking about making this for a Friends-giving at our house as an alternative for traditional turkey and we were wondering how many this recipe serves? Oops sorry just saw it serves 8. Are there any side disb recipes that you would recommend to go with the turkey? But we have so many more…please feel free to peruse! Happy cooking! This looks so savory and fabulous. It’s making my mouth water! Pinned! Love seeing real thoughts and honest emotions. I also love seeing this delicious Turkey recipe! Thank you for the uplifting words about living in the day and God’s plan. Very comforting in a time of sadness. Michael, thank you for your comments. I’m so very glad to read that you took some comfort in the post! It was refreshing to read the way you wove a Godly perspective in with the intro for the recipe. It did my heart good to read it this morning. Thanks! Lisa, that brings a big smile to my face—thank you so very much for sharing that with me. I feel like, somehow, He always gives us exactly what we need, when we need it. Thank you for reading! Can I just use a 6 pound bone in skin on turkey for this recipe? It would still be the same right? Yes, Melita, that should be just fine! I hope you enjoy the recipe! I spent the whole day watching cooking shows, flipping through magazine recipes, and looking online for a recipe for a roasted turkey breast with an orange marmalade glaze to match what is in my head for Thanksgiving this year, and your recipe seems to be closest to what I had in mind. I may try a variation that uses mostly marmalade and a little honey, with fresh orange juice and zest if needed to taste. Also, I still plan to make a gravy, but I think the glaze will be a great base. I also had in mind using fresh thyme and rosemary. Wasn’t thinking about Herbs de Provence, but that sounds like a nice addition. Thanks! Looking forward to trying this out! Well, I’m glad you stumbled upon it, Kelly! Hope you enjoy! Happy Thanksgiving, Ingrid! I thought I’d share my variations on your recipe, which was so delicious, and a keeper for sure! I did a dry salt brine the night before over and under the turkey breast skin. I rinsed it and patted dry the next morning, and spread a cold, garlic herb butter over and under the skin, and let it sit out for about 30 minutes before roasting. I used 4 TBSP butter, about 1 TBSP of fresh thyme, a little fresh rosemary, and two cloves of minced garlic for the herb butter. I also added salt and pepper on the turkey. I had my breast raised in a Staub roasting pan sitting on a neat item called a roasting laurel. I added 1/2 C white wine and 1 C chicken broth to the bottom of the pan to make my gravy base. My glaze was 3/4 C marmalade, 2 TBSP honey, 1 TBSP cider vinegar, and salt and pepper. It didn’t really need anything else. The flavors were similar to your recipe, and the turkey was amazing. It really doesn’t need gravy, but I really enjoy it, and that was very good too. I think that different herbs and spices could be added to this easily to experiment with different options. Thanks again! Has anyone actually made this yet? Also I’m thinking of using the base of your glaze and making it spicy, think it’ll work? Hi Christopher, I think you could absolutely add a little spice to the glaze to give it a little kick; why not? I’m sure it’d be delicious! God bless you. I clicked the link because the recipe looked delicious, but found a much needed word for my soul. I am going through one of the hardest and darkest times of my life right now and I truly don’t understand, but thank you for the reminder that God is there. And God bless you, Nicole! You just had your own experience with God, actually, as it seems He led you to this post in order that you would read the words you needed to read, and find comfort knowing that He is there. And you found it, didn’t you? I feel like God has a unique way of communicating (through a recipe on a food blog, of all places!) but when He does, you know, unmistakably, that you’re hearing from Him. I hope that you have a blessed Thanksgiving, and I truly appreciate your comments and all that you shared. May you be uplifted, and remember: nothing stays as it is. It’s now November 2016. I am currently reading comments and read yours. I want to ask how you are doing a year later? I hope God has given you more than you thought and are through your struggles. Please let me know if you want prayers…my email is jaynem [at] aol [dot] com. God bless you! I made this recipe today and it was awesome!! Delicious!!! Thanks for this recipe! God Bless You!! Hi Indira, so glad you enjoyed the recipe! Thank so much for your lovely comments, and for taking the time to share your experience with me—God bless you, too! It’s raining outside, I love the rain, and I just put a large boneless turkey breast in the oven using your recipe. The glaze smells soooo delicious, I can’t wait until it’s done. Thank you for the beautiful inspirational commentary. Sadly, what’s missing in our society today and not being taught our children is about our creator. Somehow it’s been decided that God is not politically correct. So, thank you for your beautiful recipe AND your beautiful words. Hi Jessica, may you thoroughly enjoy this recipe along with the rain…what a good pair! And I would truly like to thank you from the bottom of my heart for your heart-felt comments—I appreciate them very much! My hope is to uplift with my posts, and am always grateful to learn when something resonates with a reader. God bless you, and thank you for visiting! You are an angel! Love your spirit…may you receive more blessings every day from our Father in heaven. This morning I was doing as you said above…living in the past and thinking “Why didn’t I do this or why didn’t I do that and remembering all my failures”…then I moved on to the future which I also cannot control, just worrying. Thank you for reminding me that the present is what I should focus on and enjoy today. So, I got up and remembered I had a turkey breast in the freezer and thought I need to pick myself up and find a recipe for roasting it and get on with my day. Well yours was the first post that came up and drew me in. It was so inspiring and shook me back to reality and I did not feel alone anymore. It was almost as if He directed me here. thank you so much and God bless you for the message. Precious Norma, what an angel you are; and you are right: He did direct you here, to this post. There are no accidents, and when we have a fervent prayer in our heart, one for betterment and for uplift and encouragement, I have found that He always answers that. And so you found yourself here. May you feel blessed and encouraged, and may you remember that you are not alone, as you had mentioned. My hope is that you will feel some optimism knowing that all is possible in life, and that miracles happen in each of our lives all the time. Many blessings on your future—grab it boldly, and remember: with your Creator, you can do all things! Happy cooking! how long, roughly, does it take to make? I came looking for a recipe and found a much needed reminder that I’m not alone. Thank you for your kind and gentle words. Nora, that is the beauty of life…I can’t tell you how many times I’ve gone looking for something I thought I needed or was after, and ended up finding more than I ever bargained for, in a good way. So glad you stopped by, and please take comfort in the words you read. You are not alone; you never have been, nor will you ever be. Please enjoy the recipe, as well. What a beautiful way of presenting your recipes – So refreshing and wonderful advice for everyday living to be travelling with the wonderful Spirit of Love. Giving this recipe a go today. I especially loved the Godly message. God Bless to all & have a blessed Thanksgiving!!! Johnny, I truly hope you and your loved ones enjoy this! And thank you for your kind words…we hope that you have a blessed Thanksgiving Day, too, filled with lots of love and joy! Since it was just the two of us for Thanksgiving this year…I used your recipe for turkey breasts for a change from our usual. My husband gave me that look when I told him I was trying something new this year…well, it turned out perfectly. The flavor was delicious – the glaze was lighter than the usual gravy – and the turkey was so moist. He kept raving about it all through dinner, which we ate Wednesday evening…so we could take turkey sandwiches to the beach on Thanksgiving. Which is the most relaxing way to spend Thanksgiving…Thanks for sharing…I found your recipe on my phone on Huffington Post. Hi Mimi, you and your hubby are kindred spirits! It was just my husband and I this Thanksgiving, too, and we decided to go to Disneyland, lol! But I’m thrilled you both enjoyed the recipe so much…so wonderful to try something new, and have it be a success. Thanks so much for sharing with me! This has become one of my favorite go to dishes. Delicious as well as simple to make! Suzanne, so glad to read that! Thank you for sharing! Hi Judith, what a precious comment—I’m so glad you were touched by the post… In regards to the turkey, I would describe it as savory with a touch of sweet. The meat is not going to be sweet, only the skin will have a light flavor of the citrus. I’m not one for something too sweet, either, when it comes to turkey, and think you will enjoy the subtle flavors if you end up preparing it. Happy cooking! Can the glaze be made ahead of time – like the day before – and kept in the fridge? Yes, it certainly can! Hope you enjoy! I made this last year and LOVED it! This year the whole family is coming and I want to use the glaze, but for a whole 14-17 lb turkey. Do you think that would work? How many times would you recommend doubling the recipe? Hi Nicole, I would probably triple the glaze recipe, just to be sure; my recipe glazed about 6 pounds of turkey (between the two, 3 pound breasts), so I think you should do fine with that. So glad you enjoyed this last year! Have a wonderful Thanksgiving! Making this again for the THIRD year! I LOVE THIS! Thanks for letting me know, and I hope you and your loved ones enjoy it this year as much as you have the past two! Can I use boneless turkey breasts? Hi Char, that should be just fine. Hope you enjoy! Awesome, I will let you know for sure! Thank you for response. Did you have a video on this receipts? Hi Ana, unfortunately, not for this one. Made a whole turkey and the family loved it. Thanks for the recipe and God Bless. Jaerey, that’s awesome — I’m thrilled it was enjoyed! Thank you for commenting. This recipe turned out wonderfully. The turkey was moist and delicious. I was looking for a different way to prepare turkey than the usual savory preparation. The citrus and the sweetness in this recipes are a great combination. Thank you, this one’s a keeper! Hi Alysoun, how wonderful! So glad you enjoyed the those citrus notes, and that this is one you’ll make again! Appreciate your comments. This was delicious!! So glad I found this recipe. My partner who isn’t usually a turkey-breast kind of person really enjoyed it! Highly recommend to anyone who loves….well, good food!! Alicia, that is so kind of you— I’m thrilled you both enjoyed this, and that perhaps this particular turkey recipe made a convert out of your partner, lol! Job well done, and thanks for taking the time to come back and share your experience. Tish, thank you so very much for sharing this with me. I can so relate to how you feel, as I believe the vast majority of all of us can. And that is why I choose to write these more personal posts, these posts that are more “from the heart” and are meant to explore what it is to be human, and some of the things we go through. What a wonderfully self-aware thing to have this epiphany about your feelings on finding a new church/community—this indeed takes bravery, because so often it is easier to deflect and find reasons outside of ourselves why we choose to either do or not do something. But with this realization, you have taken ownership of your situation, and that makes all the difference. For sure it is an intimidating concept to “go alone”. But now that you know that this is all it is—just a little discomfort in having a go at something new on your own—you can tackle it head on. And I’m sure your effort will not go “unrewarded” (for lack of a better term), as I have the feeling you will discover some amazing things not only about yourself, but about others, when you step out of your comfort zone. Much love to you, and again, thank you for sharing. Ingrid, this is delightful! I cut everything by half since I used the rub/glaze on a cornish hen, and I added a bit of garlic powder and rubbed chicken base under the skin instead of using salt. The glaze is SO good. I kept the sides simple (baked potato, sautéed squash, apples) to let the bird shine. Thanks so much for sharing this recipe! I look forward to using the rub/glaze on a turkey very, very soon, ha. Ohhh my, that looks delicious–I’ll have to make that, too! This recipe is the 30th one I’ve tried from your site (yeah…I have a running list, ha), and we’ve never been disappointed. Thanks for the suggestion, and thanks again for bringing love and delight into our kitchen (and bellies). You just made my day with that—I’m thrilled to know you’ve prepared so many of our recipes! What an honor to be a little part of your world in this way, through the food/nourishment you put into your bodies. Ingrid, I have to let you know…this works GREAT on salmon–I had a decent amount of glaze leftover from Sunday, and I hated to toss it. So, I seasoned the salmon the same way as the hen with the herbs and chicken base, and then I added the glaze in 5 minute increments for about 15 minutes on a low broil. Delicious. I’m excited to try the flavor combination on other meats…maybe a pork tenderloin. Greetings from the Czech Republic. I was looking for something else to serve on the Christmas family table other than the typical fried fish. Recently I bought a nice piece of turkey meat at the local farm. So here it is. A lovely roasted turkey breast with cranberry sauce. I am really looking forward to it. I was browsing the net looking for something special and I found it here. Thank you for your recipes and encouriging words at this advent time. I am just on my way home from our church where was this beautiful advent wreath with first candle lit shining upon us to remind us this special time before Christmas. See you around. Ahoj! Ahoy, Petr! What a small world! I’m so very happy you found our blog, and just the right recipe for your special holiday meal…I know the fried fish offering well, and this is a little different yet perfect for the occasion! You mentioned cranberry sauce—did you happen to see our recipe for it? If you’re interested, you can check it out here. My husband and I were so warmed by your comment…may you have a beautiful, blessed, light-filled and warm Christmas, and may you feel the presence of our Creator surround you!